Here at Cosmetic Dentistry Center, we offer dentures as a solution to people looking to restore their smile. 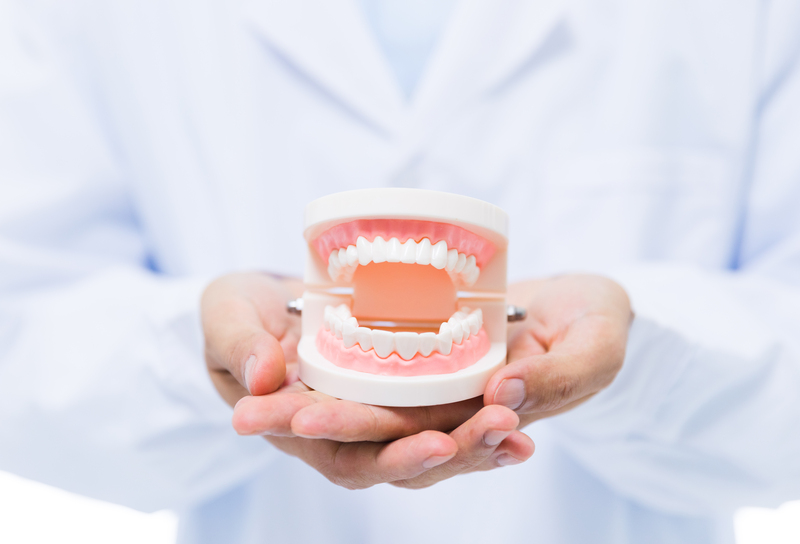 Whether patients are looking to enhance their smile, improve their speech, or put an end to dietary restrictions caused by missing teeth, dentures provide a resolution for their problems. Dentures are natural-looking, removable replacement teeth. This appliance is a solution for missing teeth and surrounding tissue in the mouth. There are two types of dentures: full and partial. Full dentures are given to patients when all the natural teeth have been removed. Partial dentures are attached to a metal frame that is connected to your natural teeth. This prosthesis is used to fill in space where permanent teeth have been removed, and it also prevents the surrounding teeth from shifting. The ideal candidate for dentures is a person who has experienced significant tooth loss, but still has healthy gun tissue and a strong jawbone. Depending on how many teeth have been lost, the patient may be a candidate for full dentures of partial dentures. Here at Cosmetic Dentistry Center, we thorough examine remaining teeth, if any, as well as bone tissue and gum health to ensure the most appropriate course of treatment is discussed. You may not be a good candidate for dentures if you suffer from severe periodontal disease or have a weak jaw structure. Restored function. Dentures are made to replicate the function of natural teeth. No dietary restrictions. Replacing tooth structure with dentures means you don’t have to give up eating the foods that you love. Functional speech. The tongue and teeth are involved in the creation of sound and words. Missing teeth diminish your ability to make certain sounds and may alter the clarity of your words. Dentures support proper enunciation of all sounds so your words come across clearly. Natural appearance. Dentures not only replace the appearance of a healthy smile, but the restored oral structure gained by a full set of teeth also supports facial contours for a natural, youthful look. Confidence. Gaps in the smile and severely damaged teeth can cause unnecessary embarrassment. Tooth replacement with dentures restores all of the usual function that adds up to optimal confidence. Full Dentures vs Partial Dentures: What is the Difference? Full dentures, also known as complete dentures, replace a full set of missing teeth. 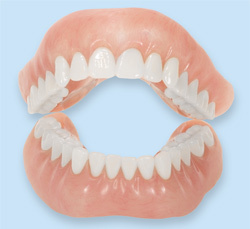 This restorative fixture has an acrylic base that resembles gum tissue, giving the dentures a more natural appearance. This base sits over the arch and may be held firmly in place with dental adhesive. This fixture is easily removed and needs to be removed for daily cleaning. The teeth of the full denture may be made from acrylic or porcelain. A full upper denture is a row of teeth set around an artificial palate. The roof of the mouth is covered by the full upper denture. A lower denture is U-shaped and fits directly over the lower arch of gums. Partial dentures are similar to full dentures in basic appearance, but they are smaller fixtures. The partial denture replaces a few teeth using the same essential removable model of acrylic and porcelain. A partial denture needs to be secured into place to be effective. This may be achieved with metal framework in the base of the denture or wire clasps that attach to adjacent natural teeth. The type of acrylic used to create the base of a full or partial denture is carefully pigmented to match the natural shade of your gums. The polymethyl methacrylate (PMMA) is also resistant to bacterial build-up, though daily cleaning is vital to ongoing oral health and fresh breath. Initial impression. Standard impressions are made to model teeth and/or the arches. From this initial impression, a custom tray is fabricated to then take a final impression. Final impression. The custom tray made from the previous impression is filled with additional impression material. With the tray inserted over the gums, a series of movements are performed. This provides accurate details of the oral anatomy, including the tongue, gums, cheeks, and muscles of the mouth, all of which need to be considered for the final design of the new denture. Wax try-in and bite registration. This step in treatment is conducted to evaluate the fit and comfort of the denture base before artificial teeth have been installed into it. Wax is present to represent where the teeth will be situated, and what height, width, and shape each tooth will take. Alterations, if needed, can easily be made to the wax and reevaluated during this visit, before the model is sent to the lab for further modification. Second try-in. During the second try-in, teeth have been inserted and are held in place with wax. This try-in lets us observe the position and proportions of the teeth and verify that chewing, speech, and appearance meet the desired outcome. If anything feels or looks “off,” discuss this with your dentist. Changes can still be made to ensure the final denture appears and feels like natural teeth. Final denture delivery. When the final denture is delivered, we try it on and make any minor adjustments that may be needed. Dentures require consistent care to maintain their integrity and support a healthy mouth. Just like natural teeth, dentures need to be properly cared for. Use a gentle cleanser to brush your dentures, always keep them moist when they’re not in use, and be sure to keep your tongue and gums clean as well. Dentures should be removed and rinsed after eating to remove food debris. While rinsing off your dentures, it is important to also clean your mouth after eating or removing the fixture. Food particles can cause gum issues and can also cause problems with wearing your dentures. Be sure to schedule regular dental examinations, as this is the best way to keep your dentures in their best shape, and to keep your mouth happy and healthy. If you ever have any questions regarding denture care, do not hesitate to call your dentist. Dentures are a commitment and taking care of them is an important responsibility to maintain. Even with excellent care, dentures can wear down over time and will eventually need to be replaced. On average, dentures can last five to eight years. Throughout this time, bony tissue and the gums may degrade and change shape. Routine checkups are essential to the long-term fit and function of a denture appliance. In today’s day and age, there are a variety of options for replacing missed teeth. The most common alternatives are dental implants and dentures. Dentures, as we discussed, are false removable teeth that are fixed to the mouth with an adhesive. While a great choice for people who have weaker gums and jaw bones, dentures are not for everyone. Dental implants are more popular among patients who have lost only a handful of teeth. Dental implants, however, require healthier gums and a stronger jawbone, so not everyone is a candidate. Be sure to ask your dentist what your options are before deciding on a solution for your missing teeth. What Are Dentures With Dental Implants? If you are missing multiple teeth and are looking to restore function and beauty to your smile, consider dentures as an option. Call our Newton office today at (617) 965-7673 to schedule your consultation.